Common knowledge states that a dull knife is far more dangerous to you than a sharp one. This becomes a problem for many people since most of us either lack the equipment or the skills to sharpen a knife. 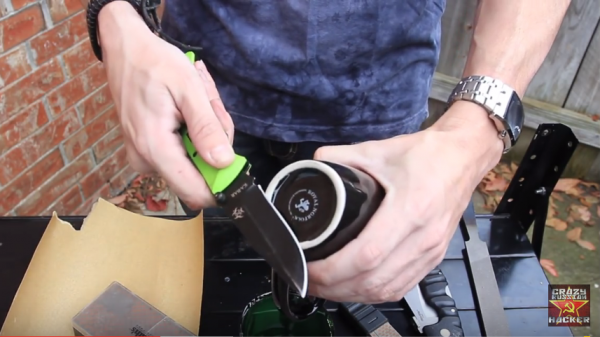 Luckily, CrazyRussianHacker and ZombieGoBoom teamed up to show people five different ways to sharpen your knife without a sharpener. 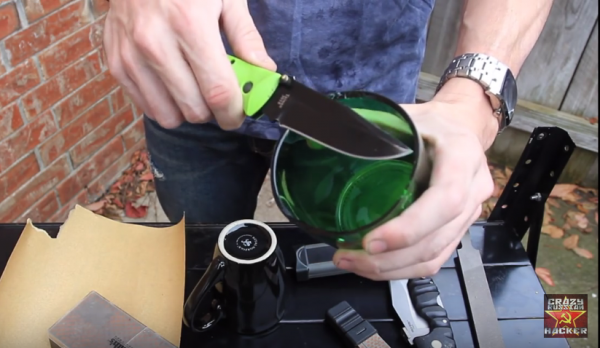 By the end of their video, you will be able to sharpen your knife, even if you don’t have any fancy equipment. 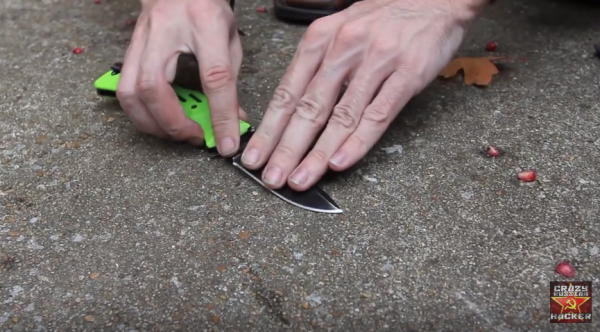 The first thing ZombieGoBoom shows us is how to sharpen a knife with a regular knife sharpener. 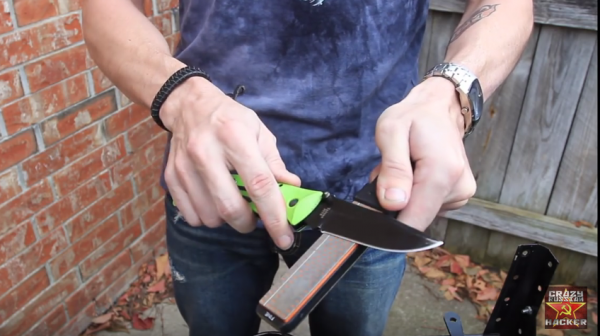 If you don’t have a knife sharpener, that’s okay, but he gives 3 good tips here about knife sharpening in general. I. The angle you hold your blade at is important. If you are sharpening a hatchet you want a 30 degree chopping edge. If you’re dealing with fine cutlery you’ll want a 10 degree edge. 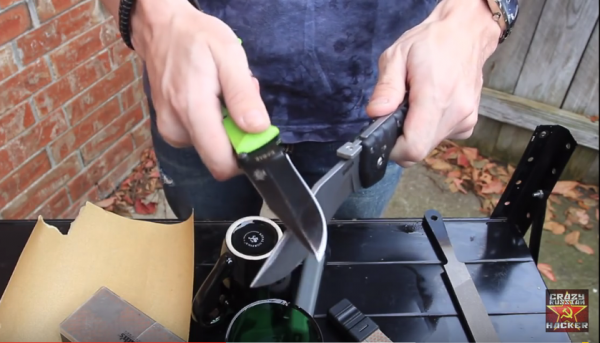 If you’re sharpening a knife for general use, you’ll probably want a 15 degree angle. Anything above 30 degrees or below 10 degrees won’t actually sharpen the blade. II. You use different coarseness levels for different levels of sharpness. If your knife is already pretty sharp and just needs a tune up, use the fine side of your sharpener. However, if your knife is dull, you’ll want to start with something coarser before moving to a finer sharpener to really put an edge on your blade. III. Sharpen each side of your blade an equal number of times. If you sharpen one side more than another, you won’t actually be sharpening it. ZombieGoBoom recommends doing three strokes and then switching sides. The second household item you can use is glass. ZombieGoBoom recommends using the top of a car window or the top of a glass cup. Either way, you use the rim of the glass in much the same way that you would the ceramic, making 3 cuts each way at a consistent angle until the blade is sharp. The third thing you can use is a piece of steel like that found on a file or the back of another blade. The only thing is that you have to worry about the hardness of the steel. The steel on the sharpener needs to be harder than the blade you are sharpening, or else it won’t work. 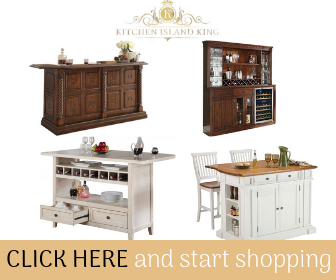 The Rockwell scale is a good measure of hardness to use in this situation. Otherwise, you just use the steel the same way you would a sharpener. The fourth thing you can use is sandpaper. This is especially good if you need something rougher than steel or ceramic. In order to sharpen your blade, just hold the paper flat and use the paper like your sharpening stone. The final thing you can use to sharpen your knife is concrete.When using concrete, make sure that it is a relatively smooth area with out any clutter. You may want to wet the concrete, but this isn’t necessary. This should only be used as a last resort however, since the concrete can damage your blade in the process of sharpening it. However, it can still sharpen your blade in an emergency. Thanks to CrazyRussianHacker and ZombieGoBoom for creating the video we got this content from. 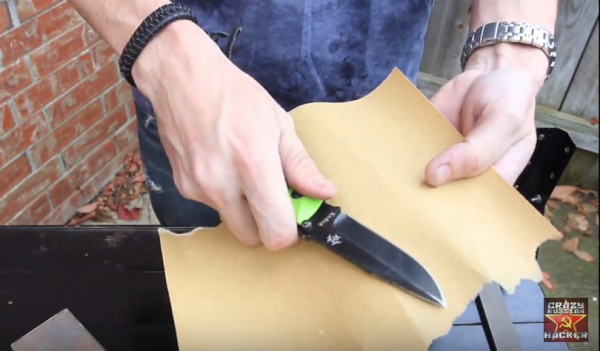 We highly recommend that you watch the original video to get more tips and tricks for sharpening your knife.